Kicheche Laikipia is a gold-rated eco-tourism lodge in the Ol Peteja Conservancy in Laikipia. There are just 6 tented suites here, so you are assured of attentive hospitality as you take in the beautiful surroundings of Laikipia and the spectacular views of Mount Kenya. You don't have to go far for your wildlife experience either, as there is an active waterhole in front of the camp, but with so much to do here you'll never be bored. Each tented suite is tastefully decorated with soft, deep earthy colours, and finished with African artefacts and fabrics. The heavy wooden beds are made from reclaimed fenceposts and are decked with throws and cushions. A large veranda is an ideal vantage point for watching the resident wildlife from a comfy chair, and there is also a hammock where you could take your siesta al fresco. The en-suite bathrooms have flush toilets hot showers and twin ceramic basins. Toiletries are provided, along with extra touches such as umbrellas, slippers and bathrobes. The main tent faces the dam, and houses the dining area and lounge. The heavey wooden table is also made from reclaimed fence posts. Meals are served here when al-fresco dining is not possible. There's a brick fireplace, cosy when lit on a chilly evening. The lounge has deep, comfy and inviting sofas resulting in a homely, relaxed atmosphere at Kicheche Laikipia. Activities centre around game drives where you will see a wide variety of wildlife that makes its home in Laikipia. Night drives are popular giving you the opportunity to spot some of the nocturnal species such as aardvark, honey badger, civet and zorilla. That's not all, there is a lion tracking programme in the conservancy and you can take part in tracking the collared lions, and relaying the data to the study centre, conservation in action. The Research and Education Centre has various exhibits which makes an interesting stop for both adults and children, you could also incorporate visits to the endangered northern white rhino breeding sanctuary or the Chimpanzee Sanctuary. If you fancy a change of pace, you could take to the water and canoe on the dam, opt for a walking safari where you will, with the help of your guide, find animal spoor, nesting birds and evidence of a whole variety of animals, insects and plants that make up this beautiful wilderness area. For something a little different you could take a safari on two wheels, together with a guide you will spend a few hours exploring on mountain bikes. There is plenty of variety here. Open: Kicheche Laikipia is closed in April and May during the worst of the rains. Location: Ol Pejeta Conservancy in Laikipia, close to Mt Kenya. Rooms: There are 6 tented suites at Kicheche Laikipia. These are spacious with proper beds and an en-suite with a shower and flush loo. One is a family tent. Solar generated power and lighting is available 24 hours. Activities: Wildlife game drives are the main activity for most guests. These are flexible, so you might want to do a couple of trips a day (morning and afternoon/evening) or you might prefer to take a picnic and stay out longer. There is a maximum of 4 people per vehicle. In addition to game drives you can take bush walks with an armed ranger. You can take a canoe on the dam and also together with a guide, explore a trail on mountain bikes. A highlight for some is the Lion Tracking programme, monioring collared lions or you may want to visit the chimpanzee orphanage. For an additional local charge you can pay a visit to the endangered northern white rhino sanctuary. Facilities: There is a comfy lounge with a selection of reference books. You can charge cameras and videos etc at the charging station in the dining tent. There is a bar. A laundry service is provided within the price. Dining: There is a indoor dining area with a heavy set communcal talbe, but it is lovely to eat outside here if the weather is warm enough. Drinks are included with meals. Picnic breakfasts and lunches are provided for game drives if you are not coming back to camp for lunch. Children: Children are welcome at the camp, however it is unfenced so adults must supervise children at all times. The camp has no baby equipment (eg high chairs, cots etc). Communication: Mobile signals here is intermittent and can not be relied on, there is Wi-Fi in the main area. Valid for all of 2019. Free night is at Laikipia and conservancy fee is payable. 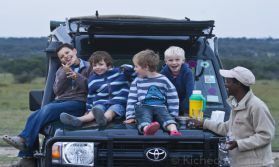 A fantastic family safari adventure in Laikipia and the Masai Mara. The Kicheche camps minimise their impact on the environment by such means as removing all non-biodegradable waste to Nairobi, using recycled charcoal dust pellets for water heating, and using solar power for all lighting and refrigeration. In addition they minimize wastage from plastic drinking bottles each room has a dispenser filled with mineral water. The camps fund the Kicheche Community Trust which helps projects in and around the conservancy communities where they operate. Their mission is to encourage the preservation of the environment whilst improving the welfare of the community through improved health and education facilities. They strive to empower the community through revenue earning projects too. The Trust builds on four corner posts of Community Welfare: Education, Health and Family Care, Community Empowerment and Environmental Conservation. They also support the Koiyaki Guiding School which trains local Masai to become guides. The Kicheche Community Project has fast become a reliable source of funding for projects in and around the Aitong area, such as the Olkimitare Nursery School, Aitong Academy Primary School, and the CMF Aitong Health Clinic.